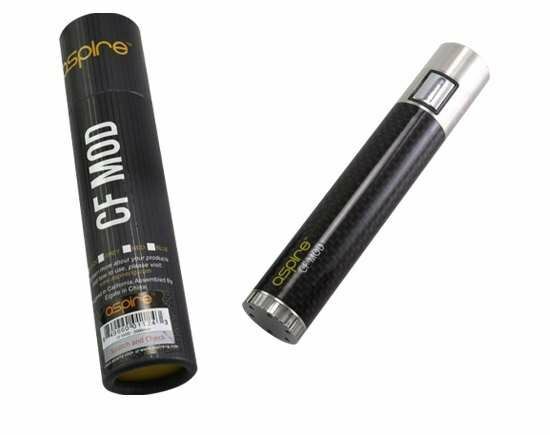 Aspire CF mod is a new launch by Aspire electronic cigarette technology. It takes 18650 battery and has a spring loaded connecter . This Unique spring loaded connector technology ensure that there is always tight connection in mod and tank. The aspire CF mod supplies intense power for low resistance tanks. Order Aspire CF MOD for best deal and genuine from Electronic Cigarette Australia. Introducing the Aspire CF Mod. The stainless steel tube with its elegant carbon fiber can house 1 x 18650 battery with a removeable cap on the bottom. Another great added feature is the overdischarge battery protection. The light that surrounds your firing button will prevent from engaging and will blink orange 15 times. The unique spring connector technology ensures to always provide a strong connection between the battery and atomizer attachment. The stainless steel metal button makes it easy to press and lights around the button for different purposes. Caution and Battery care: Do not Store the battery in a hot or humid environment.. Do not drop or puncture the battery. Do not force battery connection to other attachments. Warning : Always keep battery dry and away from moisture. Do not dismantle or expose the battery compartment-this will result in malfunction. If the indicator light displays ON continuously or product becomes hot- immediately disconnect the battery from the tank to break the electric conection.